A building in PyeongChang, South Korea is now the blackest building in history. The Hyundai Pavilion, designed by architect Asif Khan for the 2018 Winter Olympics, has been sprayed with one of the blackest pigments ever invented. 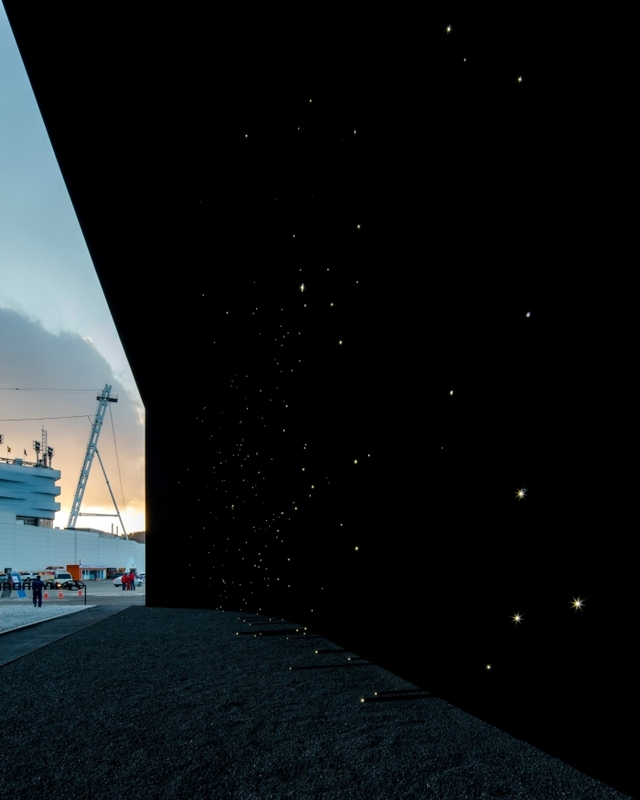 With parabolic walls that stand 10 metres (33 feet) high, and 35 metres (115 feet) long, the exterior has been coated in Vantablack VBx 2, the spray paint variation of Vantablack. Vantablack VBx 2, made by Surrey NanoSystems, absorbs 99 percent of all visible light, resulting in mind-melting, void-like blackness. While pretty cool, the original Vantablack is painstaking to apply to surfaces. It's made from millions of vertically aligned carbon nanotubes, each with a diameter of around 20 nanometres (around 3,500 times smaller than the width of a human hair) and 14 to 50 microns in length (1 micron is 0.001 millimetres). When light enters this forest of nanotubes, it gets trapped, bouncing around until it dissipates as heat. The original method of coating a material with Vantablack nanotubes involved "growing" them via chemical vapour deposition. It's powerful, though, absorbing 99.6 percent of all visible, infrared and ultraviolet light. Then Surrey NanoSystems invented a sprayable version that blocks only visible light, laying down the nanotubes in a random configuration; and the VBx paints, that don't use nanotubes at all, but can be used for commercial applications. This latter product is what has been sprayed on the Hyundai pavilion. When in shadow, the three-dimensionality of the walls of the pavilion seems to disappear. It's bristling with rods, the ends of which are lit to appear like stars against the extreme blackness. "From a distance the structure has the appearance of a window looking into the depths of outer space," Khan said in a statement. "As you approach it, this impression grows to fill your entire field of view. So on entering the building, it feels as though you are being absorbed into a cloud of blackness." Inside the building, the interior is the opposite - pure glossy white, made from Corian, a surface material more commonly seen in kitchen benchtops. The entire room is a water installation, with 25,000 water drops per minute flowing across the hydrophobic surfaces. Haptic sensors allow visitors to interact with the installation, changing the rhythm of the droplets as they collide and flow towards a central lake, which drains, and reappears, and drains again. It is, the designer said, reminiscent of a city seen from space. And both parts of the pavilion, commissioned by Hyundai, align with the car manufacturer's hydrogen fuel cell by referencing the hydrogen in the stars and the hydrogen in water. "The water installation visitors discover inside is brightly lit in white. As your eyes adjust, you feel for a moment that the tiny water drops are at the scale of the stars," Khan said. "In the project I wanted to move from the scale of the cosmos to the scale of water droplets in a few steps. The droplets contain the same hydrogen from the beginning of the universe as the stars." The pavilion will open to the public at the PyeongChang 2018 Opening Ceremony on February 9.